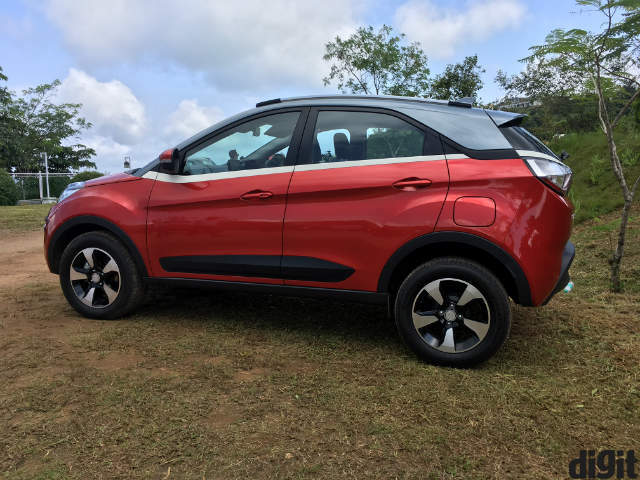 The Tata Nexon is a new chapter in Tata Motors' book, in terms of in-car technology, sophistication, design and the overall cohesive experience of a good drive. You must have seen the Tata Nexon concept in plenty of photos by now. From initial unveilings at the New Delhi Auto Expo 2014, to showing it off at Geneva Motor Show this year, Tata has been upbeat about the Nexon for a long while now. Driving it around the winding uphill roads in Kochi, I could totally see why. So what all have changed? Well, pretty much everything. The Tata Nexon concept relies heavily on design, and brings with itself a completely new design. Alongside, you get completely revamped interiors, two new engines, a new transmission, a bigger steering wheel with a new electric motor, and all of these combine to make the Tata Nexon a truly "new" car. Hence, quite understandably, Tata's bets behind this one are quite big. The Tata ConnectNext infotainment system gets a significant upgrade with this new generation platform. Still built on BlackBerry's QNX platform, the new ConnectNext infotainment software gets an all-new interface that changes the theme based on the mode you are driving in. It gets more refined icons, although some of the chunkiness of the older UI are still retained. The biggest addition to this new system, along with the bigger display size, are Android Auto and Apple CarPlay. While CarPlay will be released for the system in the coming days, Android Auto is already enabled. 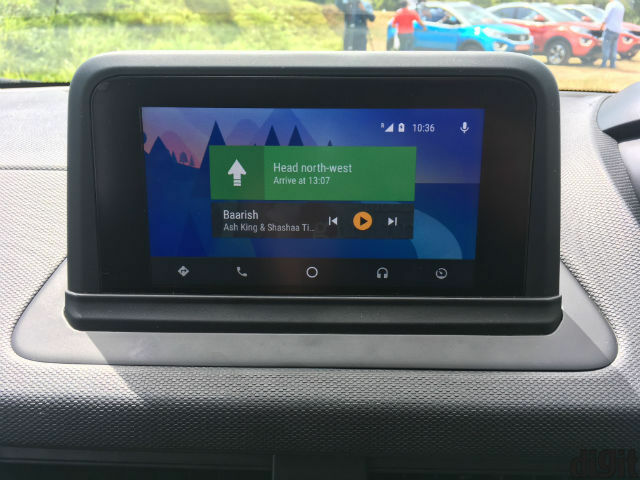 Alongside, you get Tata's updated ConnectNext suite of smartphone apps to use if Android Auto is not really your thing. The ConnectNext apps are also finally coming to iOS, which should make the appeal of this infotainment system more universal. Moving on, the display now gets a floating design akin to the way Mercedes-Benz and Audi have put their displays in cars. It does not retract into a recess, but the design itself looks significantly more upmarket and practical than the previous, central column-mounted one. The Nexon gets a new, 6.5-inch display with screen resolution of 800x480 pixels and 140ppi pixel density, which is richer than before. Tata states that the upgrade was enforced to make the system eligible to support Android Auto and Apple CarPlay, and now meet the graphic and screen size requirements. While it is indeed richer than before, it is not very sharp or hi-res, and the display does look a tad bit lacking in fidelity. You get USB support for audio playback, and loading photos and videos to be viewed when the car is static. 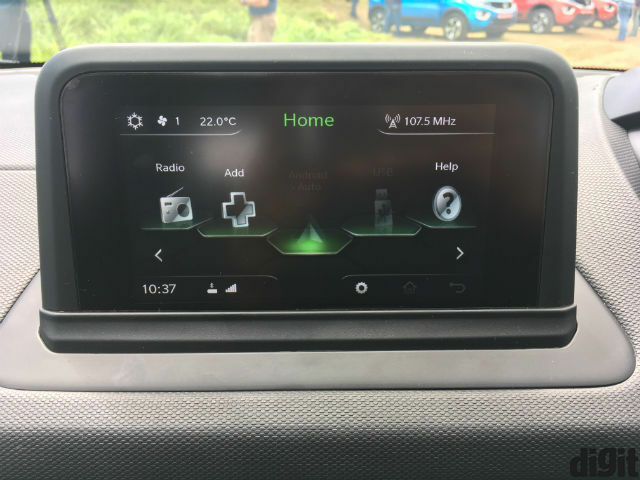 Other resources include an aux-in for wired audio connectivity, Bluetooth for wireless connectivity, phone synchronisation to load contacts and call lists, full air conditioning control, and navigation support via Android Auto (Google Maps). The new interface itself is quite easy to operate, include four hubs of controls in the four corners of the display. To the top-left you get Climate Control settings including air recirculation, air flow, blower, Economy mode, and AC temperature settings. The top-right corner houses input modes - two USB ports, aux, Bluetooth, FM and AM. The bottom-left panel acts as a control center, somewhat mimicking Apple's iOS. 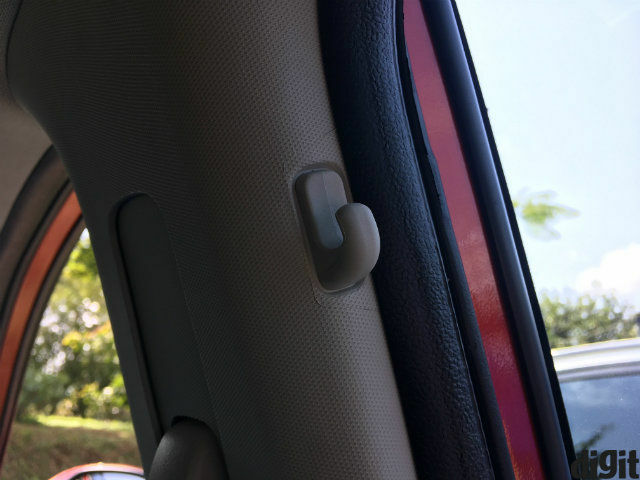 This includes quick music toggles, notifications from the connected phone, display brightness dimmer, radio frequency tuner, device selector, and display and audio on/off. 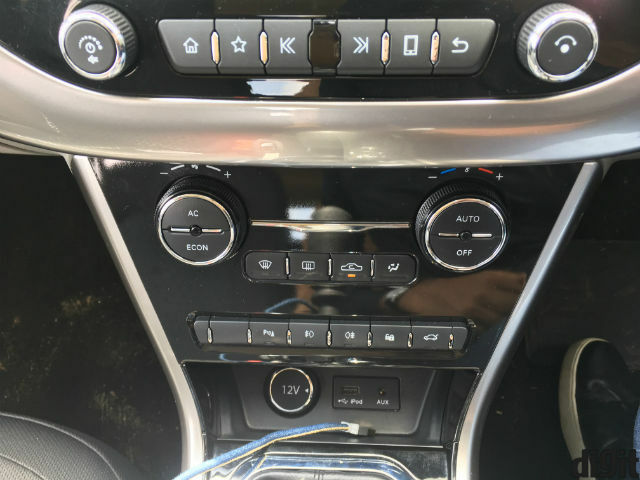 The bottom-right panel includes vehicle, audio, Bluetooth, volume, general and all settings tabs. Sifting through the icons on the display shows split-second stutters, which is not really surprising. The richer display also helps the rear view camera, which also gets dynamic guiderails to ease reverse parking. The touch response for the infotainment system is quite smooth, and there are hardly any missed taps. You can alternatively operate it from the six, column-loaded physical buttons. 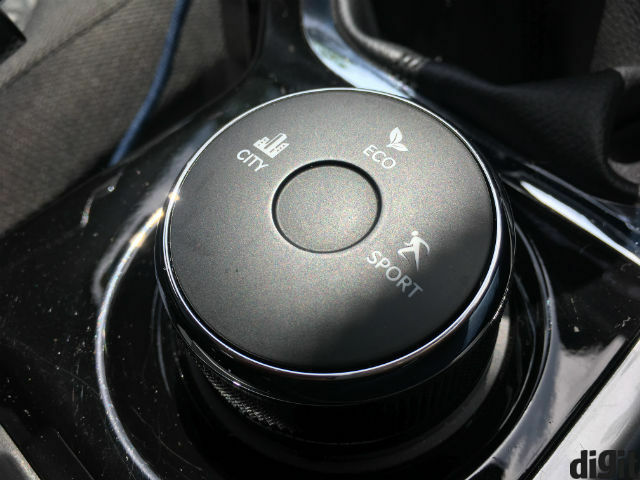 There is also one customisable button to which you can assign a favourite function, and a chrome-embellished toggle to swipe through the settings and icons on the infotainment display. Operating the system is easy and ergonomic, and it falls in the driver's line of sight to aid safety. However, a better resolution display would have certainly been welcome. 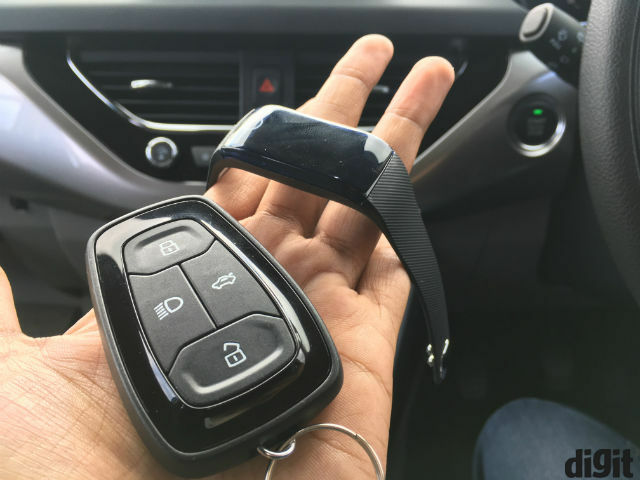 The last bit of interesting technology that Tata is working on is a wrist band that will negate the need for carrying the car key around. The band is still being perfected by Tata, and it is not sure yet if it will be an optional accessory or included as standard equipment with the car. The band will work as a fitness tracker and a key authenticator, and you can simply wear it to your morning jog, keep track of your steps and heart rate, and not worry about carrying around an extra key fob. This is yet another element about the Nexon that is really impressive, and will add to the overall end-user experience when it is launched. The Tata Nexon gets eight Harman-built speakers, along with four amplifiers of 25W RMS each. Despite the impressive configuration inside the rather well-insulated cabin, the sound itself is not boomingly loud. The audio itself is on the flatter side by default, and you will need to work the equaliser manually to get a respectable balance of the frequency range. One impressive bit here is that the factor of audio distortion at high playback volumes is not there, which makes the overall music sound quite clean. It is not the loudest, but the audio quality itself is fairly commendable. 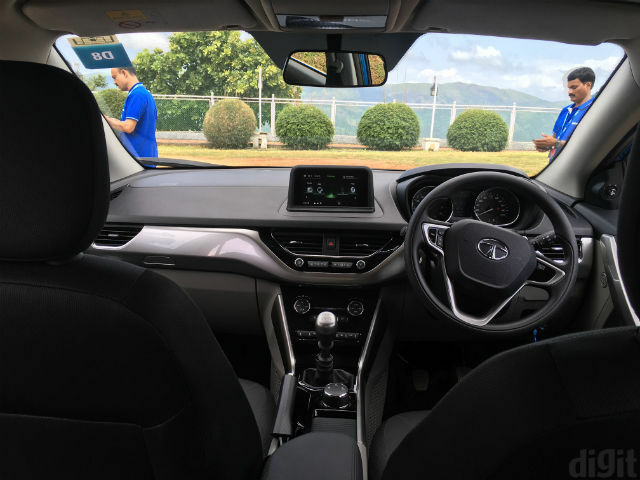 Among all the other bells and whistles inside the Tata Nexon are an automatic climate control system, power-operable outside rear view mirrors, a chilled glove box with cup, phone and iPad holder, rear parking sensors, rear AC vents with blower control, LED DRLs (which can be switched off by a two-step mechanism), and the familiar MFD in the instrument cluster that, unfortunately, remains the same old monochrome strip. You do not get any button on the steering wheel or on the wiper/light knobs to control the MFD, and have to reach out to the instrument cluster for the Mode button to switch through two trip meters, an odometer, overall mileage, and temperature and date/time display. 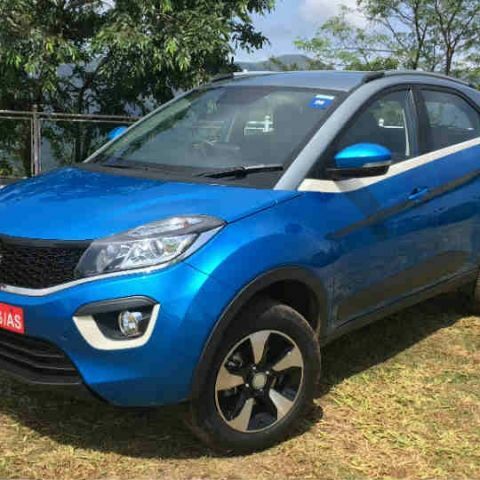 All of these bring up a feature-laden equipment list, which is one of the key factors that Tata is banking on for the Nexon. Staying true to its promise, the Tata Nexon actually feels way more premium than the previous Tata cars. 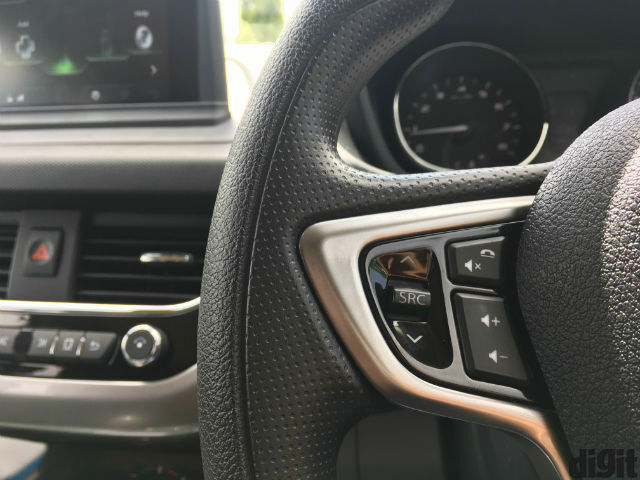 The interiors have been redesigned, and now include better quality plastic inserts - both glossy and matte textured ones, chrome strips, contrastic colour schemes and a modern-looking dash. The straight line of the dash looks impressive and seamless, with the floating display looking quite chic. The central column with the control toggles and buttons feel a little bland from the aesthetic point of view - while the textured top of the dash along with the floating display looks young and exciting, the lower half looks borrowed from older cars. In-car ergonomics are good - the wide window line on the door gives good room to rest your elbow on, and there's a central armrest as well. The door controls are placed well within reach, and the fabric inserts add a touch of warmth and continuity to the interiors. You get a sliding door to hide away the storage space in the central column, and the addition of this layer also contributes to the neatness of the central column in terms of functionality and design. 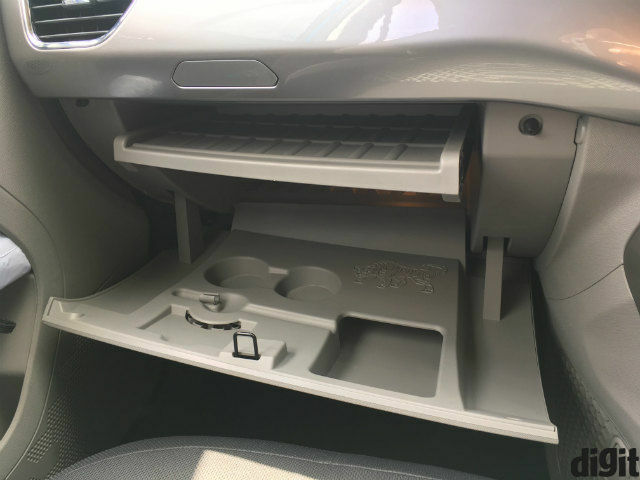 The 12V power socket, USB and aux ports are placed in a recess that is a tad too deep to reach, but works in terms of stowing your phone in the same cubbyhole. The drive mode controller is rather large, and while it doesn't feel out of line, it could have been less prominent and that would have contributed to the overall design. The rear seat bench has good recline, although the window line is a bit high for those who are not too tall. There is plenty of headroom and shoulder room, and three, moderately tall people can sit quite easily here. The Nexon also provides decent leg and knee room, and thigh support is reasonably pliant as well. There is a central armrest that opens up with cup holders, and two AC vents add a touch of personalisation. You get blower control as well to control air intensity in rear seats. There is also a 12V power socket mounted above the rear left headrest. The overall quality, fit and finish has been hiked from before, and now feels much better than before. However, it remains to be seen how the components fare in the longer run to give a better verdict. This is where all of Tata's efforts are concentrated on, and it really shows. 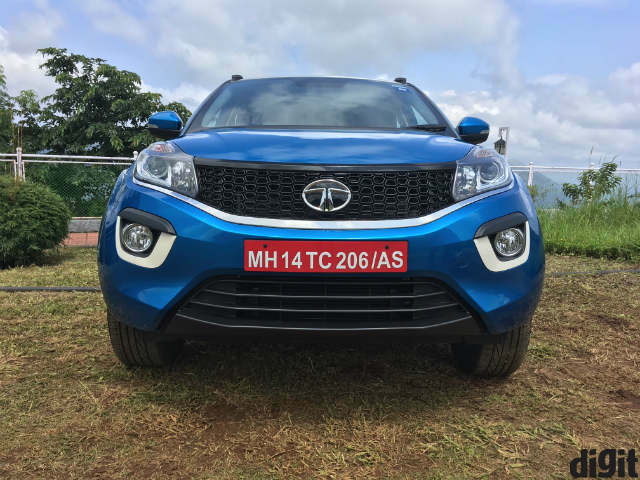 The Nexon retains the blackened honeycomb grille from older Tata designs, along with a chrome slab that Tata calls the 'Humanity line'. The air dam is wide and adds a touch of aggression to the front facade, and the teardrop headlamps now get an LED strip that is the Daytime Running Light. Moving towards the rear you get swooping lines that move to the rear end, and a bold plastic cladding around the glass cabin that looks unlike any car design that we've seen till now. The roofline resembles a coupe, and has a lot of boldness and muscle to hold its own character on the road. A few of these lines may not be impeccable in terms of the seamless flow, but the quirky design looks modern and unique, and really works. 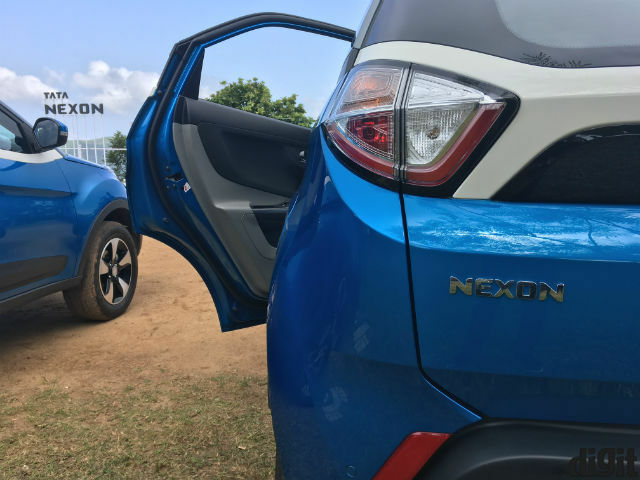 There were a lot of people on the road during our test drive stopping to look back, and even take a photo of the car, and the Nexon actually resembles what its concept looked like. The contrast roof colour and body colour along with the plastic line creates a nice texture to the car, and you will certainly not miss it on the road. We now have two new engines powering the Nexon - a 1.2-litre turbocharged petrol and a 1.5-litre turbocharged diesel. Both the engines produce 110 brake horsepower, with the petrol engine producing 170Nm of torque, and the diesel one, 260Nm. The petrol engine does produce more power than before, but it is not really the most exciting powertrain out there. The power delivery is fairly flat and linear, which really works in the city. However, the 'City' mode does feel somewhat underpowered, and so does the 'Eco', so we often shifted to 'Sport' to get the most out of the car. The new 6-speed transmission has shorter gear ratios to accommodate the extra gear, but you will need to really work the gears to get the most out of the engine. Even then, it is not the sportiest out there, but in what I really liked, has a quaint linearity about it where it does not feel underpowered at all in most city drives, and even at moderate speeds on the highway. The steering's electric motor has been upgraded and now provides better power assistance, weight distribution and feedback on the road. The steering is more responsive and accurate, and coupled with the good weight distribution, eases handling of this rather heavy car. The suspension is beautifully balanced, and it is this that makes the ride quality so good. There is pillowy comfort on the road, and the Nexon does not get easily unsettled by sudden bumps. This makes it a great car to be on the back seat, and the interior equipment array makes sure that you have a comfortable, plush ride. The Tata Nexon is a mighty impressive effort in our books. It looks different from everything else on the road, makes heads turn, rides and handles really well, and has a lot of features and storage space to aid practicality. You get automatic climate control, Android Auto (and Apple CarPlay soon), better interior quality, a good steering wheel, and almost everything that makes for a good car. There is, of course, room for improvement - the steering wheel itself could have been bigger, some of the lines on the outside feel disjointed, a few elements inside still feel a bit commonplace, and the engine itself is not very peppy for enthusiastic drivers. However, not until you nitpick that you come across these elements. The Nexon is relying on the technology inside to become a hot seller, and Tata may potentially price it anywhere between Rs. 6.5 lac to Rs. 10.5 lac, all variants considered. With that good pricing and the incredible list of features on board, we expect a lot out of the Nexon. It all remains to be proven in the market, this festive season.